Few people would recognise Wild Carrot plants even when they are in flower, even though the root vegetable is so very well known. The umbrella-like white heads of this biennial wildflower usually have in their centres a single purple flower with unequal petals, Thewhite florets each have five tiny petals 2-3mm long, and the lower bracts behind the flower heads are conspicuously pinnate (divided into three spikes). Narrowly-branching hairy stems of Wild Carrot grow to a metre in height, with alternating feathery leaves finely divided into bi-pinnate or more often tri-pinnate leaflets. At the base of the stem there is a narrow taproot, but it bears very little resemblance to the roots of carrots grown in cultivation. As the seeds develop the seed head becomes progressively more concave, eventuallycurling up into a tight, bristly ball. Common and widespread in Britain and Ireland, especially in coastal areas, Wild Carrot's geographical range covers temperate parts of Europe and southwest Asia, but its origin is thought to have been parts of western Asia from where it was transported to Europe several hundred years ago. In other parts of the world, including Australia and North America, this umbellifer is an introduced alien species. This mainly coastal plant is a summer wildflower of dry grassland; it can be seen in swathes on the verges of country lanes, field boundaries and sheltered grassy cliffs and dunes near the sea. 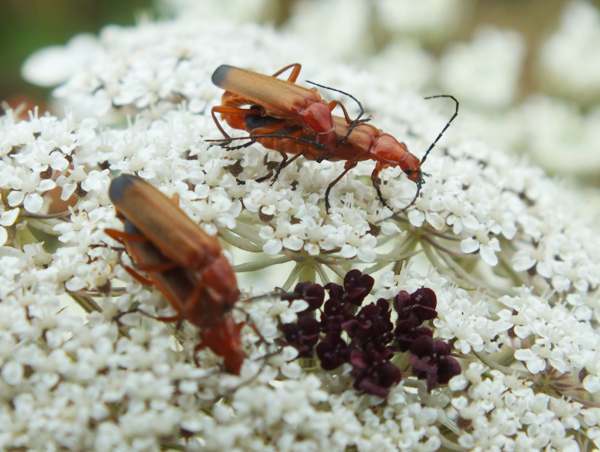 In Britain and Ireland Wild Carrot can be seen in flower from June through to late August or early September. 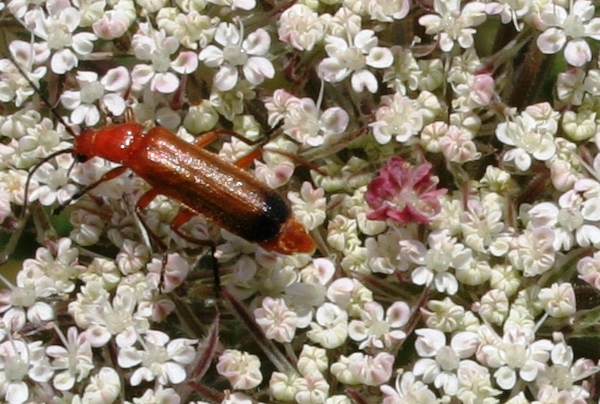 Cultivated carrots come from the variety Daucuscarota, var sativa, but the roots of Wild Carrot itself taste much the same and can be eaten when young; however, the roots of old plants become tough and unpalatable. 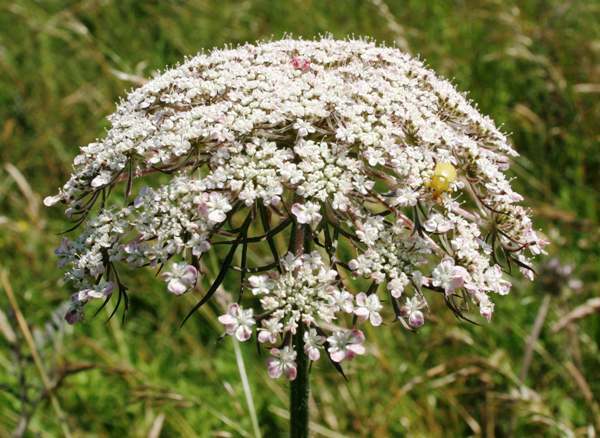 (Great care is necessary, as some similar umbellifers are deadly poisonous.) The fruits of Wild Carrot were used medicinally as a diuretic in the treatment of kidney problems. Wild Carrot is one of the larval food plants of Swallowtail butterflies, Papilio machaon, which is common in southern Europe and an occasional migrant in the south-east of England. Daucus is an ancient Greek name for this plant, and the specific pithet carota simply means carrot. One of the old common names for this wildflower is Queen Anne's Lace; one explanation is that the tiny purple floret in the centre represents the queen and the surrounding white florets make up her lace collar. Another theory is thatQueen Anne pricked her finger when lace-making, and the purple spot is her blood. Hemlock Conium maculatum is a deadly poisonous umbellifer that could be mistaken for Wild Carrot - with disastrous consequences if eaten. 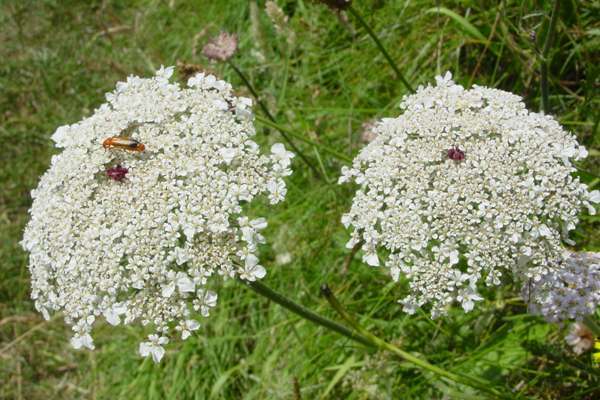 Many other members of the family Apiaceae, including Wild Angelica Angelica sylvestris and Hogweed Heracleum sphondylium, are sometimes mistaken for Wild Carrot Daucus carota.